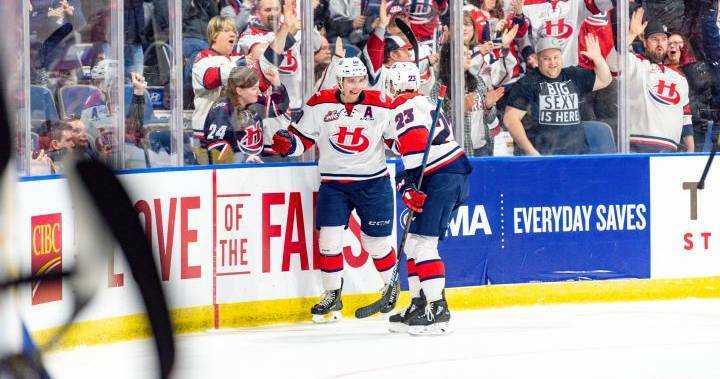 Lethbridge Hurricanes forward Jake Leschyshyn notched his first career playoff hat trick Saturday night, as he led the ‘Canes to a 4-1 win over the Calgary Hitmen in game two of their opening round WHL playoff series. The Hurricanes now lead the best of seven series 2-0. The Hurricanes were slow starters in game one of this series, but shot out of the gates in game two. Twenty five seconds after puck drop Nick Henry dangled around a Hitmen defender and beat Calgary goalie Jack McNaughton to give the ‘Canes an early 1-0 lead. Leschyshyn would score two times before the first period was out to give the Hurricanes a 3-0 lead through twenty minutes of action. In the second period Calgary started to mount an offensive attack of their own, but couldn’t beat ‘Canes goaltender Carl Teteachuk. The Lethbridge native turned aside 32 of the 33 shots he faced on the night, including multiple point blank scoring chances in the middle stanza. In his first two playoff games Tetachuk has been unflappable, stopping 63 of 66 shots faced. Leschyshyn completed his hat trick night in the third period when he whacked a loose puck past McNaughton to give the Hurricanes a 4-0 lead. The Saskatoon native felt more comfortable in game two then he did in game one. The Hurricanes will now leave the friendly confines of the Enmax Centre as the series shifts to Calgary. Game three of the series will be played at the Scotiabank Saddledome on Tuesday night.